There was a lot of debate over which feature film to watch - to get the best combination of 3D and Sound. For our purposes though, we needed a combination of best picture and sound - which meant it was really between the bottom two, and Tron Legacy was the one that got the most votes. The super-sharp visuals and crisp Daft Punk soundtrack make it a pretty lively and engrossing experience, even though the 3D effects aren’t quite up to the very best. To accompany the home movie experience, we also had to have the best possible movie food - i.e. hot dogs and popcorn; not just any kind though, Icelandic-style hot dogs (all about the condiments q.v.) and proper movie-theatre-style popcorn. One of Reykjavik’s must-do experiences is a hot dog and coke from ’Bæjarins Beztu Pylsur’ or literally ’The Best Hot Dogs in town’. The Icelandic ones are a mix of pork, beef and lamb, and have particularly snappy casings - Bæjarins Beztu boil their ’dogs’ in beer and beef stock, and have the super fluffy buns steamed for extra softness. The real pièce de résistance though is in the condiments area - where you layer down tomato ketchup, finely chopped raw, then crispy fried onions, next the remoualde (a mayonnaise with pickled vegetables type of thing! 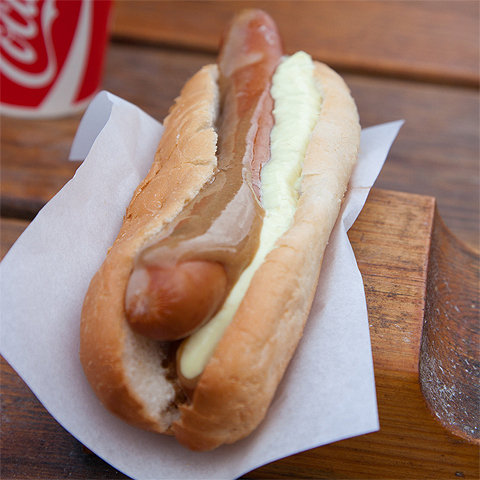 ), then the ’dog’ with a line of sweet mustard on top - as in the above photo which shows a genuine ’Bæjarins Beztu’ hot dog. A goood sized pot with beer + stock is brought up to the boil, then you turn the heat right down and drop in your hot dogs - letting them gently simmer for circa 5 minutes - before layering them up with your preferred condiments. The English hot dog rolls are a lot more stodgy than the Icelandic ones - you can try using Whartburtons Sub Rolls which are slightly larger, but closer to the texture of the Icelandic ones! The essential kit here is the Whirley-Pop Popper which produces the best home-made popcorn you can get - in the above picture, there can be seen two bottles of Coconut Oil - this has a melting point of circa 40º C - which means I stand it in a bowl of hot water to get it liquid - as per in the right-hand bottle illustrated (left hand is solid at room temperature). 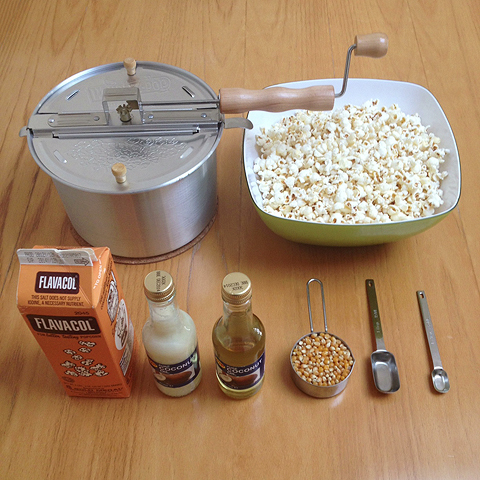 For perfect popcorn you need 2-3 table spoons of Coconut Oil, 1/2 a cup of Popping Corn and 1/2 a teaspoon of Flavacol - it all goes into the pot together, and then you apply a medium-high heat. It takes just 3-4 minutes of turning the crank - to make a very generous amount of tasty popcorn - pour into bowl immediately, but let is stand a couple of minutes before digging in. Next: It's 2013 Record Store Day tomorrow - support your local store - even if it's an HMV! Previous: Today is Free Comic Book Day - Support your local comics store!